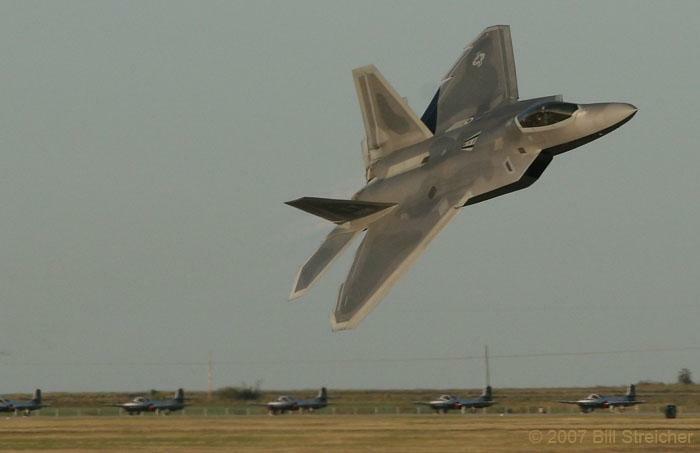 This F-22 from the 325th Fighter Wing at Tyndall AFB, Florida was shot by noted patch collector and aviation photographer Bill Streicher on an October evening in 2007. The aircraft was photographed during a dusk flying display for base personnel prior to a Saturday Open House & Air Show at Sheppard AFB, Texas. Great shot Bill! Patches below are worn by pilots assigned to fly the F-22 like the one above, at Tyndall AFB, Florida. Click the image to enlarge.